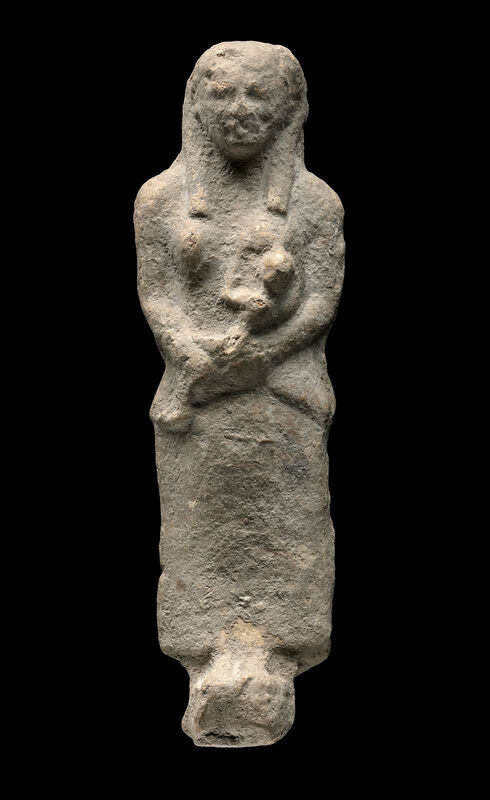 This standing figure is of the type Aphrodite Kourotrophos (Nursing Woman) and depicts a woman nursing her child. Most Aphrodite Kourotrophos figures are seated and standing examples, such as this one, are rare. A similar type with the goddess Isis nursing her son Horus is found in Egypt. A strong Egyptianizing style is seen here in the hair and face. This could be an image of Cypriot Aphrodite as kourotrophos, which adopts the Phoenician-Egyptianizing kourotrophos type. The figure is very flat and was probably propped up against a wall or bench in a sanctuary. The figure bears no trace of color.